This high-poly model is an excellent for video animation and rendering stills! Nieuport is built near to scale, it is extremely detailed including Le Rhone 130 hp rotary engine. It also includes a lot of detailing in the cockpit. It has a Vickers machine gun and mounting, and or a Lewis Machine gun on a Foster Mount on the top wing. The rotary engine and propeller, ailerons, elevators and rudder are animateable. 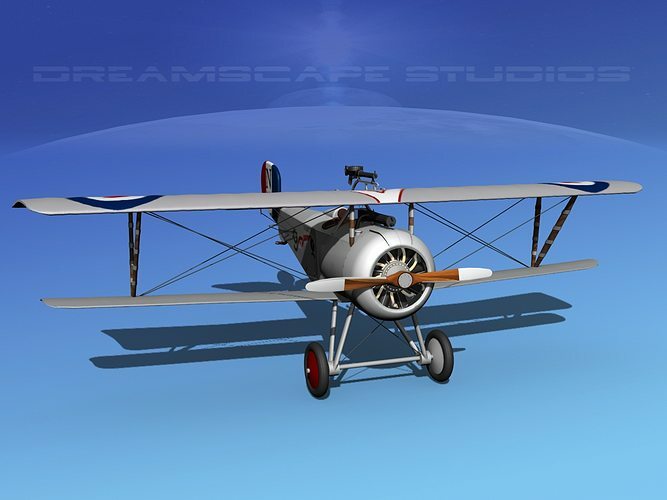 This model is a very high poly model and has a lot of modeled features in the wings, fuselage and tail. . It comes in more than 10 formats for your immediate downloading. The Nieuport N17 was a more powerful development of the earlier Nieuport N11. Originally it was powered with a 90 hp Le Rhone rotary engine and in later development was powered with a 130 hp Le Rhone rotary engine. It was capable of outstanding maneuverability and a very high rate of climb. It was armed with the synchronized Vickers automatic machine gun for French aircraft and Lewis Gun mounted on the Foster type mount on the top wing for British ordered models. These saw service beginning in 1916 replacing the Nieuport 11 in French service at the time. German Luftwaffe captured some examples and passed them on to manufacturers for copying. The result was the Siemans-Schukert D.1. The SPAD VII had been developed and was fast replacing all the Nieuport in service. Most allied aces had at one time flown the Nieuport.